YUMMO - 365 Days of Eating and Being Fed : Kimchee Bokum Bap - Korean Leftover Favourite! Kimchee Bokum Bap - Korean Leftover Favourite! There are dishes in every cuisine that will never be found on a menu. Alas, they are often the best. Perhaps some day the homey Korean favourites will become more popular they way peasant dishes like Bread Pudding and Haggis have. Until then you'll have to enjoy my photos or try it out yourself. There is always cooked rice in a Korean home. I remember a few years back, we all joked about the omnipresent halogen fire hazard lamps everyone was buying as being aliens setting up for the invasion. Well, that could certainly be said of the ubiquitous Rice Cooker in Korean homes. I'm not talking about the tin bowled, one button dealy you can buy at Walgreens or London drugs for 20 bucks. No. Those work fine except on harder grains or brown rice. Forget brown rice in those things! No, they've come along way, the simple Rice Cooker. For years, the next generation were the self contained cookers that let you know when they're done and kept your rice warm for upto a day. Though mom still had to do the end 're-do' where you press the cook button one last time to ensure the bottom was 'cooked' away from the bowl. Then a few years back they evolved yet again. The Rice Cooker!?? Now mom's Rice Cooker plays some Bach when the Rice is done and it needed be pressed again. It shows a timer for cooking and how long it 'should' be kept in the cooker. The link is to a similar one. 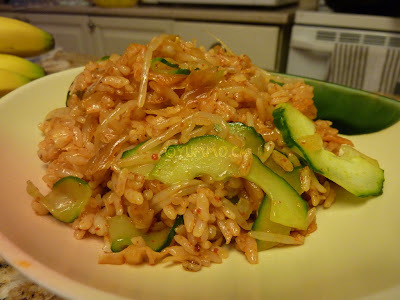 One of my favourite dishes as a kid with leftover Rice was Kimchee Bokum Bap. Bokum is a stirfry. Bap is Rice. It is a simple and humble dish that is super simple and amazingly tastey. In a Wok, heat the Oil on high. Your Bean Sprouts should be blanched and drained before frying. Toss the Onions for a minute or two until slightly softened. Add the Garlic for a minute. Add the Rice Sprouts, and Kimchee. Toss and mash. Toss and Mash. Add the Kochujang and distribute thoroughly. If the Kimchee is spicy enough for you, leave out the Kochujang and add a couple of T of the Kimchee juices. Mom made her own Kochugadru (Chili Powder) for her Kimchee so it was pretty firey as it was. Turn the heat off.Add the Sesame Oil to the pan and distribute. Garnish with the Cucumber. You can use Scallions and Sesame seeds too.